Get ready to start hearing a lot about Martin Luther. On 31 October 2017 it will be five hundred years since Luther nailed his Ninety-Five Theses to the door of the Castle Church in Wittenberg, initiating the Protestant Reformation. In fact, as scholars have long known, and Lyndal Roper immediately concedes, whether Luther ever actually posted the Theses in this way is doubtful. But there is no doubting the momentous consequences of the confrontation with the Papacy sparked by Luther’s disquiet over the theology of indulgences. In Britain interest in the anniversary has so far been relatively muted – a contrast with Germany, where an entire decade of official commemorative events is accelerating towards its climax. But Luther undoubtedly belongs to that relatively select company of eminent dead foreigners of whom nearly all British people have heard, and he enjoys the reputation of being a force for historical good: a prophet of individual conscience and liberty against oppressive structures of power and inherited patterns of thinking. 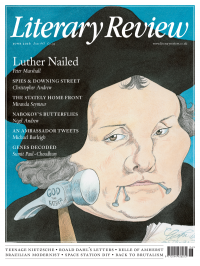 Roper’s beautifully written life is not exactly an exercise in debunking, but she admits that Luther is a ‘difficult hero’. Her publishers’ claim that the book represents the first historical biography ‘for many decades’ is hyperbolic chutzpah, but it is certainly among the most interesting, provocative and original biographies of Luther to appear in recent years – one that tackles head on the challenge of entering into and exploring the interior life of its subject. Half a century ago, the American psychoanalyst Erik Erikson’s book Young Man Luther argued that the trajectory of Luther’s career and the emergent shape of his revolutionary theology were explicable in terms of his troubled relationship with his father, Hans Luder. Among Luther scholars, and historians in general, Erikson’s book has come to exemplify a type of ‘psycho-history’ seen as reductionist and anachronistic. Yet Roper, who has employed psychoanalytical insights fruitfully in previous work on gender and witchcraft, is unafraid to venture back into this disputed territory. She recognises the risk of ‘reducing major ideas to the outcomes of unconscious wishes or conflicts’, but nonetheless believes that the key to understanding Luther lies in his rebellion against the overbearing Luder, a master miner who wanted his son to become a lawyer, not a priest. Luther’s entry into the monastery was a kind of retreat into a matriarchal world of female saints, which ultimately failed to provide respite from crippling Anfechtungen (spiritual doubts and temptations). In the end, having clung to and outgrown a succession of substitute father figures (such as his confessor, Johann von Staupitz), Luther allowed God himself to become his father. The utter dependence expressed in his doctrine of justification by faith alone supplied the resolution to a relentless inner conflict. Luther, Roper thinks, could write compellingly about the ‘freedom’ of the Christian precisely because his own independence of self had been fought for so bitterly and at such great emotional cost. It all makes perfect sense; maybe too much sense. One of the perils of psychoanalytical explanations of motive, in history as in life, is that once the initial hypothesis is accepted, occurrences can readily be made to conform to it. Yet Roper’s approach is consistently stimulating and exciting, serving to open up debate rather than close it down. She can certainly be absolved of one of the besetting sins of psycho-history, that of under-representing the social and cultural context of the subject. Roper paints remarkably vivid pictures of the mining community of Mansfeld, where Luther grew up, and of the university town of Wittenberg, where he was formed as a thinker and lived almost his entire adult life. Rather than the solitary genius of legend, we see a Luther deeply embedded in relationships and the sometimes petty social concerns of a small provincial town. Roper’s Luther is a man of intense friendships and equally intense enmities. His openness, personal warmth and ‘breezy indifference to formalities’ are attractive characteristics. But he was also a man energised and motivated by opposition, who could be extraordinarily intransigent, authoritarian and unforgiving. Was this a blessing? Only ‘someone with an utter inability to see anyone else’s point of view’, writes Roper, ‘could have had the courage to take on the papacy’. The tragic course of Luther’s relationship with Andreas Karlstadt, loyal disciple turned bitter critic, is traced in rich and moving detail. Luther had a tendency, extreme even for his age, to personalise theological disagreements and, since he identified his own cause so closely with Christ’s, to see opponents as literally demonic. It led him to misunderstand the causes of the great peasant risings of 1524–5 and to call for the punishment of rebels in terms shocking even to contemporaries, let alone sensitive liberals today. Nor does Roper tiptoe around the most controversial aspect of Luther’s thought: his visceral anti-Semitism. This is often regarded as either a typical prejudice of the era or as an unfortunate peculiarity of embittered old age. Roper unsparingly documents how hostility to Jews was a leitmotif of Luther’s career, going beyond the conventional anti-Semitism of contemporaries, Catholic and Protestant. It was not incidental but central to his theology: ‘true Christians’ (in other words, Luther’s followers) were the new chosen people of God; Jews had to be displaced, disparaged, even destroyed. Luther’s calls for the burning of synagogues and Talmuds were nothing less than ‘a programme of complete cultural eradication’. This is to come close to resurrecting another mid-20th-century theme: the argument that Luther was a progenitor of the Holocaust. Roper does not quite say so, though she is not shy of asserting that Luther’s top-down view of political authority – a product of his psychological dependence on God as father, and of his upbringing in a princely territory rather than a self-governing town – ‘provided the theological underpinnings of the accommodation many Lutherans would reach centuries later with the Nazi regime’. Luther viewed a Christian as simul justus et peccator (‘at the same time justified, and a sinner’). It is appropriate, therefore, that Roper regards this authoritarian figure as also, paradoxically, a prophet of liberation. He never exhibited the instinctive revulsion for female bodies felt by many monks (was that because he grew up with younger sisters?) and he came to renounce asceticism and espouse ‘remarkably uninhibited’ views on sexuality and marriage, as well as to enjoy a full sexual life himself after marrying the ex-nun Katharina von Bora. This was the unexpected consequence of a ‘gloomy anthropology’: if all human actions were intrinsically sinful, then sexual pleasure was no worse than other forms of human indulgence and could cheerfully be enjoyed and celebrated. For a leading feminist historian, Roper is surprisingly forgiving towards Luther’s notoriously patriarchal and chauvinist attitudes, pointing out that when he said that women should ‘bear children to death’, Luther was in fact insisting that the agonies of childbirth were natural and pleasing to God and simultaneously denouncing the widespread belief that women in labour were under the sway of the devil. Yet the paths of sexual liberation were dangerously uncharted. In denying marriage to be a sacrament, and thus any right of the Church to regulate it, Luther accidentally set himself up as an authority in marriage disputes: his advice, as Roper documents, ‘at times seemed to have been made up on the spot’. In 1539 Luther caused lasting damage and embarrassment to the cause when he privately agreed that Philip of Hesse, a leading Lutheran prince, could, like a polygamous Old Testament patriarch, covertly contract a bigamous second marriage. Even before the age of the leaked email, there was no chance of a signed memorandum such as this remaining secret. On occasion, Roper’s generally sure-footed negotiation of Luther’s theological landscape stumbles slightly. She considers it an ‘extraordinary concession’ that Catholic representatives at the Diet of Augsburg were ready to agree that salvation came ‘by faith and grace, not by works alone’. But no reputable medieval theologian believed people could be saved ‘by works alone’ (a version of the ancient Pelagian heresy) – the process necessarily began with an unmerited offer of God’s grace. In noting en passant that Luther speculated very little about the afterlife, Roper overlooks his teaching about a pre-resurrection ‘sleep of the soul’ – intensely controversial in the 16th century and rapidly rejected by the Protestant mainstream. She rightly lays emphasis on Luther’s belief in the Real Presence of Christ in the Eucharist, but goes on to paint this as an aspect of his thinking ‘which is difficult to understand today and where the gulf that separates our world from his seems at its greatest’. Roper’s ‘our’ evidently does not extend to the many millions of Catholics and other modern Christians who do believe Jesus to be really present in forms of bread and wine. No one, however, can accuse Roper of failing to take Luther’s ideas seriously: the particular virtue of this book is its determination to relate those ideas to the social settings in which Luther was formed and to the personal preoccupations and inner life of a flawed but fascinating individual. Aspects of the presentation will doubtless infuriate uncritical admirers, as well as some Luther scholars of the old school. Yet this unfailingly inventive and compelling account is a welcome gust of fresh air into the thick celebratory atmosphere of anniversary season. There will never, and never should, be a ‘definitive’ biography of Luther. But anyone seriously interested in one of the most influential figures of the last half-millennium will need to make time to read this one.